So you all know I absolutely adore Soap and Glory and it's always on 3 for 2 in boots this time of year so I always like to take advantage of that so I picked up the bigger version of Hand Food to keep on my bedside table in place of the smaller one I had (which now lives in my handbag), The Daily Smooth body butter, which smells absolutely gorgeous, it smells like the Mist You Madly body spray if you know what that smells like. Then the last thing I got was the Glad Hair Day conditioner, I've had mini versions of this in the past and loved it so much so I decided that it was time I bought the big one! As with all soap and glory products, this smells fab and what I love the most about it (apart from how amazing my hair feels after using it!) is that the smell stays on your hair for ages after using it. 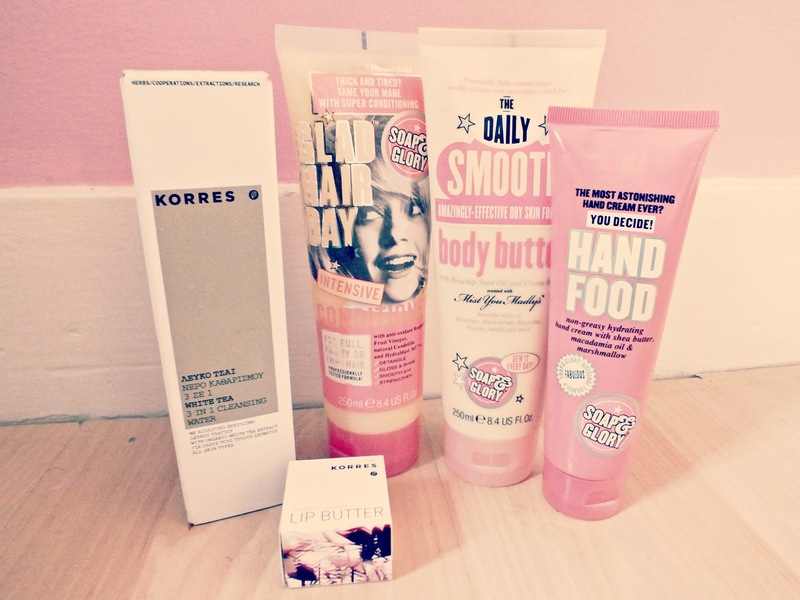 I find that with a lot of Soap and Glory things, I smell them all day after using them, which I love! Then I got a couple of Korres things, the 3 in 1 White Tea Cleansing water was a TK Maxx bargain, which Darren actually found (brownie points!) it was down from £16 to £4.99 so I couldn't say no could I? I think this is a similar concept to the Bioderma Cleansing Water, which I've wanted to try for a while but couldn't get hold of. So I was super excited to try this. This is honestly such an amazing product so I'll definitely review it in full very soon. Then lastly I got a Korres lip butter, which I've wanted to try for ages as I've heard so many great things about them. I got the Jasmine one as I thought it looked the prettiest but now I definitely want more. Again, I'll probably do a full review of this at some point if you'd be interested in that. Hope you enjoyed or saw something you'd like to pick up, let me know if you're interested in any particular reviews! I love soap and glory, don't know who doesn't! great haul! yes, they seriously look gorgeous all photographed together! so so pretty! i love the korres lip butters, i have the one in quince which is really lovely, the colour and the scent!